Mylan N.V. announced on Aug. 29 that its U.S. subsidiary will launch the first generic to EpiPen Auto-Injector (epinephrine injection, USP) at a list price of $300 per generic EpiPen two-pack carton, which represents a discount of more than 50% to the Mylan list price, or wholesale acquisition cost, of the branded medicine. The authorized generic will be identical to the branded product, including device functionality and drug formulation. Mylan expects to launch the product in several weeks, pending completion of labeling revisions. Upon launch, the product will be available as a two-pack carton in both 0.15 mg and 0.30 mg strengths. 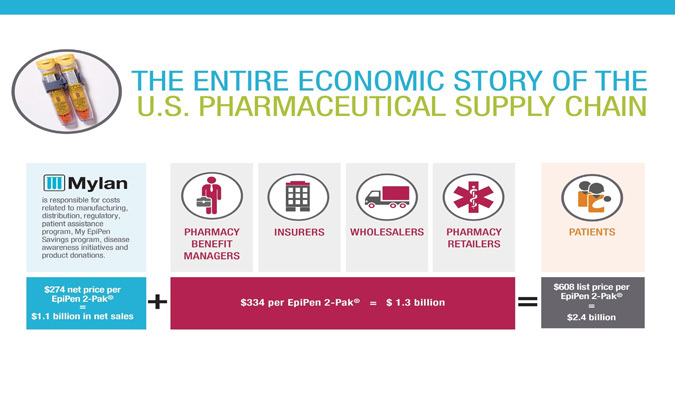 Mylan also intends to continue to market and distribute branded EpiPen. See the full release to see more about the EpiPen. After an extensive review of the latest scientific evidence, the U.S. Food and Drug Administration announced on Aug. 31 that it is requiring class-wide changes to drug labeling, including patient information, to help inform health care providers and patients of the serious risks associated with the combined use of certain opioid medications and a class of central nervous system (CNS) depressant drugs called benzodiazepines. See the full release to learn more about the new drug labeling. Sherwin-Williams announced Poised Taupe (SW 6039) as the 2017 Color of the Year. A modern take on a timeless classic, Poised Taupe signals a new direction in society’s ever-growing thirst for beautiful neutrals that bring warm and cool tones together to create one irresistibly versatile color. “Poised Taupe celebrates everything people love about cool gray as a neutral, and also brings in the warmth of brown, taking a color to an entirely new level. Not cool or warm, nor gray or brown, Poised Taupe is a weathered, woodsy neutral bringing a sense of coziness and harmony that people are seeking,” says Sue Wadden, director of color marketing for Sherwin-Williams. See the full release to learn more about trends in paint colors. United Continental Holdings Inc. on Aug. 29 announced that Scott Kirby has been named president of United Airlines. In this newly created role, Kirby will assume responsibility for United’s operations, marketing, sales, alliances, network planning and revenue management. Kirby’s appointment is effective immediately and he will report to Oscar Munoz, United’s CEO. Kirby joins United from American Airlines, where he held the title of president since the merger of American and US Airways in 2013. See the full release to learn more about Kirby and his role at United. According to a Princeton Review survey that asked 143,000 students at 381 top colleges to rate their schools on dozens of topics and report on their experiences at them, the college at which students gave their teachers the highest marks is Wellesley College (MA). It is #1 on the “Best Professors” list in the education services company’s tallies for its 25th annual college rankings released this week. Topping the Princeton Review list, “Great Financial Aid,” based on students’ satisfaction with their aid award packages, is Vassar College (NY) — a not-so-surprising distinction, given that Vassar’s average undergraduate need-based scholarship last year was $45,100. See the full release to learn more about the rankings.